1 What Are T5 Grow Lights? 5 How Do T5 Lights Compare to Other Types of Lighting? If you’re sick of putting your seedlings in a windowsill that doesn’t get much sun, or you just want to super-charge your indoor gardening process, you should consider a T5 grow light. Your seedlings, herbs, and greens will respond immediately to the increased amount of light you’re giving them. But it’s not enough to just put a few light bulbs over your plants. If you already have lights, chances are they’re T8’s or T12’s​ and you should consider purchasing indoor grow lights that are optimized for your plants. That’s what we’ll get into in this beast of an article giving you everything you need to know about T5 grow lights. If you just want to see my recommended pick, see below. There are more reviews at the end of the article as well, so be sure to check those out if you want more options. The Agrobrite fixture from Hydrofarm comes in 2′ and 4′ lengths, with the 2′ length offering 2, 4, or 8 tubes, and the 4′ length offering 4, 6, 8, or 12 tubes. The 2′, 4-bulb fixture is the best choice for most indoor gardeners. It’s a low-profile fixture, so is perfect for growing in tight spaces vertically or horizontally. It comes with 6400k bulbs and multiple switches, so you can control the number of bulbs that you want on at any given time. Hydrofarm is an extremely reputable supplier that I have used for a lot of the gear in my hydroponic garden — air pumps, water pumps, and the list goes on. They’re a special type of fluorescent T5 grow light that has become the industry-standard for growing seedlings and greens indoors. The bulbs are 5/8″ in diameter and are some of the most efficient fluorescent bulbs you’ll find on the market.​ In the past, T8 and T12 bulbs were used, but these have fallen out of favor due to the massive efficiency increase in T5 bulbs. In fact, you can’t even manufacture T12 bulbs anymore in the United States — they’re that inefficient! Fluorescent lighting is quite efficient when compared to other types of indoor lighting like high pressure sodium, metal halide, or plasma lights. And efficiency matters a lot. You’ll save money on your energy bill and get a better yield per dollar you invest in running your lights. There are two other types of popular fluorescent tube lights out there — T8 and T12. Compared to those, T5 is the most efficient by a long shot. T5 bulbs can reach ~100 lumens per watt, which is extremely high for this type of lighting. Other types of lighting can exceed 100 lumens per watt easily, but have downsides that may make them a poor choice for your garden. Depending on what you’re growing, fluorescent grow lights can reduce your lighting energy consumption by over 50%. When you consider those savings over the course of a year, it really starts to add up. Almost all fluorescent grow lights will last for 20,000+ hours. More importantly, you’ll have good bulb performance throughout those 20,000 hours, without much degradation as your bulbs reach the end of their lives. The superior lifespan of T5 bulbs is yet another factor that brings the true cost of using these lights down. You can get away with really close placements. As an indoor gardener, controlling your environment is crucial. And one of the most annoying factors to control is the heat of your grow room. No matter what lights you use, heat will be emitted from them which causes your grow room temperature to rise. Some of the hottest lights require dedicated cooling systems, venting, and fans to control for the massive amount of heat they produce. If you’re growing in cramped grow tents, these lights can be a fantastic option. On the other hand, T5 grow lights run extremely cool. This means you can place them close​ to your plants without burning the leaves, increasing the amount of light they’re able to take in. Hotter lighting systems, like HPS or MH, need to be at least a foot (or more) away from your plants, while you can place T5 fluorescent lights just 2-6″ away. While we’ve talked mostly about T5 fluorescent lights​, there is another option if you want to go that route: T5 LEDs. Let’s dive into the pros and cons of each type of T5 bulb. We’ve already talked about T5 fluorescent lights, and for good reason — they are by far the most common type of T5 fixture used for indoor gardening. Many gardeners have switched from more powerful lighting like HPS or MH in favor of T5 fluorescent lights for the benefits outlined in the section above. Some growers are stuck on LEDs and want to use them in a T5 setup. This is entirely doable. You can purchase LED tubes that fit your T5 lighting fixtures and convert the entire thing over to an LED system. Of course, no type of lighting is without its downsides, and LEDs are no exception. If you decide to go with T5 LED bulbs instead of fluorescent, you’ll have the same issues as you would with any other type of LED bulb. In the not too distant past, you could choose between T5, T8, or T12 fixtures for your garden. However, progress happens and things change. In 2012 the Department of Energy banned the manufacture of T12 fixtures simply because they are so inefficient when compared to alternative technologies. While you can’t buy new T12 fixtures, they’re still out there in the used markets and existing gardens…although i don’t know why you’d want to track them down. They’re bad. How Do T5 Lights Compare to Other Types of Lighting? 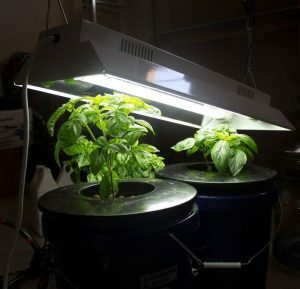 ​High pressure sodium (HPS) lights hold a venerated position in indoor gardens worldwide. They’re powerful and efficient lights that can bring almost any plant from seedling to fruiting stage. From an efficiency standpoint, most HPS lights edge out T5 fluorescents, although only by about 40 lumens per watt. However, the increase in efficiency has a trade off in the form of increased heat output. If you’re using HPS lights, you’ll need to place them further from the canopy of your garden. You may also need to vent the heat out with fans and ducting if they run especially hot. On top of that, HPS lights take up more vertical space in the garden. If your growing area is small and not too high, your plants may find themselves cramped for space as they grow when using HPS lights. If you decide on T5 grow lights instead of HPS, you’ll lose out in lumens per watt, but will have a cooler grow room with less space taken up by your lighting system. You’ll also spend less money on energy costs in the longer run, even though T5 bulbs are more expensive than HPS upfront. T5 bulbs last longer and degrade slower. High intensity discharge (HID) lights are another option to look into. Technically, HPS lights are in this category, but let’s take a look at the HID category in general to understand what differences lie between it and T5 lights. For this additional complexity, you gain more lumens per watt, and typically a more complete spectrum of light, allowing you to run HID lights throughout the growing cycle of your plants. No matter what type of HID lighting you choose, they will always run hotter than T5 grow lights. Again, you’ll need to deal with this excess heat somehow — ducting, venting, or fans are all good options. You simply have to pay a price for the extra power you’re getting. Without a doubt, the biggest craze in grow lights over the past few years are LED grow lights. Their popularity has exploded, and so has the manufacture of these lighting systems. This is for good reason — LEDs are extremely efficient, they put out minimal heat, and last for ages. Manufacturers like to talk about their 100,000+ hour lifespan, but what they fail to mention is that there is a serious drop in efficiency after about 30,000 hours or so. You might be saying, “OK, but that’s still better than T5 grow lights, which last for about 20,000 hours.” And you’d be right, but LED lights are typically more expensive than T5s, although the price has come down slightly in the past year or two. In the end, it will come down to your budget and your preference, especially with some newer white LED systems coming onto the market. An example of a T5 fixture with 12 bulbs. While T5 light bulbs are all a standardized 5/8″ diameter, the size of the fixtures they come in vary, making them a flexible pick for your grow room. You can find just about any combination of length and number of bulbs that you need. When deciding which to buy, consider buying as large as you can fit in your indoor garden. You can always turn off some of the bulbs if you don’t need them…but you can’t turn on bulbs that you don’t have! Most T5 fixtures come with 6500K bulbs. This is because most growers use these lighting systems for microgreens, seedlings, and plants that they harvest in their vegetative state. However, you can grow plants that flower and fruit in a T5 system. You will need to pick up some 3000K bulbs, however. They’re easy to find on Amazon and come in five packs in lengths of two feet and four feet. Aside from sizing differences, there are two main styles of T5 grow lights — one with the lights encased in a rectangular reflector, and one with a gull-wing reflector. I prefer to use encased reflectors and place my lights closer to my plants for optimal light coverage, but if you have to place your lights higher, you may want to consider the gull-wing style. It will allow you to redirect light that’s “spilling” out of the sides of your grow room. Be on the lookout for extra features that extend the capability of your T5 lights. The most important one is the ability to control bulbs separately, either by dimming or with switches that turn off some bulbs and leave others on. With these features, you can save on energy and give plants only the light they actually need to grow. It’s particularly helpful when starting seedlings, because their light requirements are so low compared to a bushy plant in the middle of its vegetative phase. Before you even think of buying new grow lights, measure your growing area to determine the largest lighting system that you can fit. You may need to buy multiple units and place them side by side to get maximum coverage. Sometimes one single unit simply won’t give you the coverage you need based on your grow room’s design. 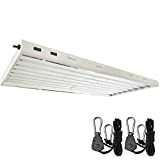 While my official policy is to always buy the best lighting that you can afford, T5 grow lights run relatively cheap compared to other types of lighting. This has upsides and downsides — it can be really easy to get started growing with T5 lights, but adding more can start to add up, so do your research before you pull the trigger. If you already have grow lights, you should consider how adding T5 lights will supplement your existing setup. Unless you plan to replace your old lights completely, it’s a good idea to run a rough calculation of the total energy cost and light output of all of your lights combined before making a purchase. The bulbs in a T5 light fixture are interchangeable, so be sure to check what is coming with your system. You should default to bulbs designed for vegetative stages of growth, as fluorescent fixtures excel in the vegetative stages. But don’t be afraid to pick up some flowering bulbs as well. Like many different types of indoor grow lights, the manufacturer matters a lot. Because there’s so much competition in the space and every manufacturer wants their piece of the pie, stick to established brands that have a history of respectability and authority in the space. Stay away from unknown knockoffs. What are you going to grow with these lights? If you’re trying to grow large fruiting plants you may need to upgrade your size and wattage requirements to get the job done. As I mentioned before, T5 grow lights are fantastic for seedlings, microgreens, and any plant that you harvest before it flowers. The Agrobrite from Hydrofarm is a best seller for a reason. It comes in 2′ and 4′ lengths, with the 2′ length offering 2, 4, or 8 tubes, and the 4′ length offering 4, 6, 8, or 12 tubes. The 2′, 4-bulb fixture is the best choice for most indoor gardeners. It’s a low-profile fixture, so is perfect for growing in tight spaces vertically or horizontally. This model from DuroLux is an excellent budget choice. It’s 4′ with 4 6500k bulbs, which is an extra 2′ when compared to the Agrobrite. The savings are due to the gull-wing construction instead of the encased reflector. As far as features, you can dim the inner two bulbs and/or the outer two bulbs in pairs, making it a flexible pick. You broke it (I’ve done this multiple times). You want to use a different color temperature for different growing goals. The best recommendation for you is the Agrobrite 6500k 4-pack of 4-foot, 54w bulbs. They cover most use cases for growing under lights and have no problems fitting right into your growing system. If you have a large growing area and want one light to take care of all of your lighting needs, go with the Hydro Crunch. It’s $30 cheaper than the Agrobrite 4′ by 8 bulbs. However, you do lose the ability to turn on only some of the bulbs with the Hydro Crunch as it doesn’t have multiple switches. Hydrofarm 7-Day Digital Timer​ – To customize your lighting schedule and remove the need to manually turn them on and off. Saves a bunch of time. Apollo Horticulture Adjustable Grow Light Rope Hangers – Trust me, buy these. They’re cheap and allow you to adjust the height of your grow light quickly and easily, which is absolutely necessary as your plants mature. AcuRite Indoor Temperature and Humidity Monitor – Make sure you have the right growing conditions so you don’t suffer from any stress, pests, or diseases. Q. Should I use T5, T8, or T12 lights? There is no question. You should always use T5 lamps instead of T8 or T12, The efficiency of T5’s simply can’t be beat​, and you won’t even be able to purchase T12’s in the USA anymore due to how inefficient they are. Q. How much light do T5 lights put out? Q. How many T5 light fixtures will I need? Q. Are T5 lights energy efficient? With the exception of LEDs, T5 fluorescent lights are some of the most efficient bulbs that you can buy. You’ll save a ton of money compared to HID, HPS, or MH bulbs if you’re growing seedlings, greens, or herbs, both is energy costs and the cost of venting away excess heat. When shopping for a T5 bulb, does it have to be a ‘grow light’ or will any T5 bulb with the correct spectrum be sufficient to use as a light source for plants. In other words, is a ‘T5 grow light’ a special kind of T5 bulb that are different from the regular one I have in my kitchen? I have to agree with Mark about the HEAT of T5 HO bulbs. They do get much hotter than let’s say T8 bulbs. What is the recommended height for seedlings. I’m talking lettuce,tomatoes,peppers etc. The recommended height is always “as close as possible without burning your plants”. Usually for a T5 that means at least 8-12″ away from the top of your plants. The Agrobrites are VERY warm——I don’t know why all the online comments about how COOL they are! That’s simply not true. Someone doesn’t know how to use a thermometer. My old T12 shop light fixtures are MUCH cooler!! I had to raise the T5’s way up to keep the temp from cooking my plants. I’m not real thrilled with the expensive Agrobrite at this point. I like the T12 shop lights I’ve been using better, I think. Time will tell, but just be aware that these lights get hot—-they will cook your plants. There’s nothing ‘cool’ about that! Not big on the T12’s from an efficiency standpoint, but to each their own! Any LED that advertises a ‘wattage equivalent’ is going to draw less than the # advertised. A 54w equivalent usually draws 18w, for example. At what point in the growth cycle should I change out a couple of the 6400K tubes with 3000K tubes to promote flowering and fruiting? Really depends on what you’re growing there Charlton! I’m feeling very appreciative of this information right now. I’m growing succulents indoors in the PNW region and am happy to set up grow lights to keep them vibrant. There is so much is sift through and so much lazy information just thrown out there. You’ve really done a great job putting this all together and it seems to be some of the most comprehensive info out there. Then I have a T5 HO I just recieved from amazon that stressed my aloe and made it’s leaves curl in while sitting 6″ away. Not sure if it’s wattage or the HO part, though I’ve seen people comment that they have their HO T5s just barely above their plants. I’m actually trying to install a wooden shelving unit to hold all my succulents and I need a light that can sit a few inches above so that the shelves aren’t all 23″ apart. lol. It might be the positioning, or the heat output for your succulents under the T5 HO. Hard to say for sure, always about experimenting to figure out what works for your particular garden. Thanks for the kind words – I really do try to put out the most comprehensive information I can, so that means a lot! Good point on the spectrum, Maurice. I should do a comparison grow between T5 and LED. Any vegetables you’d like to see grown side by side?